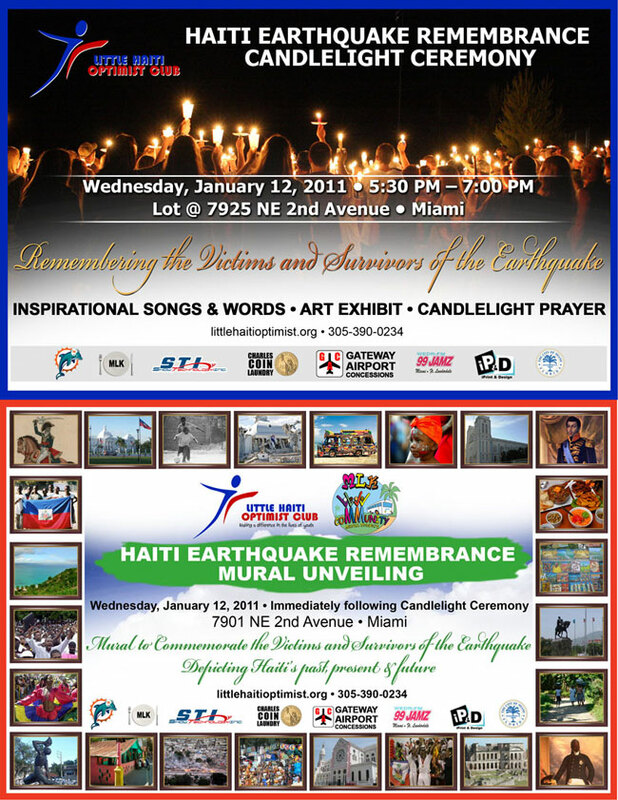 Miami –The Little Haiti Optimist Club (LHOC) will host the Haiti Earthquake Remembrance on Wednesday, January 12, 2011. The purpose of the event is to commemorate the victims and survivors of the earthquake that devastated the island nation of Haiti almost one year ago on January 12th, 2010. As part of the remembrance, LHOC will unveil a 5,000 sq. ft. Mural located at 7925 NE 2nd Avenue in Little Haiti between the hours of 5:30PM to 7:30PM. The entire community is invited to participate in the unveiling and the candlelight ceremony. The program will begin with inspirational songs, remarks by elected officials, community leaders and survivors of the earthquake and will culminate with the Candlelight Reflection Moment in remembrance of all the victims and survivors. Following the stage program, attendees will take a short walk to participate in the unveiling of the Haiti Earthquake Remembrance Mural painted on the building located at 7901 NE 2nd Avenue. The strategic location of the building lends itself to making sure that the mural is highly visible to commuters and the community for many years to come. Ron Volk is the owner of the building and generously donated the space for the mural. The mural which will depict Haiti’s past, present and future, is designed and produced in partnership with the MLK Community Mural Project. The mural will not only honor the victims and survivors of the devastating earthquake, but more importantly raise awareness as well as raise funds for families devastated by the tragedy. Established Haitian and American artists, as well as students from Little Haiti Optimist Club and Youth Expressions are participating in painting the mural and bringing the vision to life. “The earthquake was a day that many will not forget. With South Florida having the largest concentration of Haitians and Haitian Americans, our goal and commitment is to ensure that Haiti is not forgotten”, said Adam Grossman, Senior Vice President of Public Affairs for the Miami Dolphins who provided all the supplies for the mural project. Other generous sponsors of this project are: MLK Restaurant, Gateway Airport Concessions, Show Technology, Charles Coin Laundry, I Print & Design Miami, WEDR-FM 99 JAMZ and the City of Miami. “This is the most important project I’ve worked on because hundreds of thousands lost their lives and the country where I was born was destroyed. As an artist, I hope this mural helps all of South Florida reflect on Haiti’s history, present and a better future to come once the country is rebuilt”, said Serge Toussaint. Other artists include: Kyle Holbrook, Cairns “Nice” Athouris, Addonnis Parker, Darrin Watson, Bayunga Kialeuka, Chris “Punch” Purdy, Kevin “Smurf” Morris, Lordgyn “Gino” Belizaire and Veronica Estrada. The entire community is invited to participate in the Haiti Earthquake Remembrance Candlelight Ceremony and Mural Unveiling. For more information and to sponsor, visit www.littlehaitioptimist.org or call 305-390-0234. The Little Haiti Optimist Club is a non-profit organization established by a group of business, community and civic leaders to provide assistance and guidance to the youth of Little Haiti. The organization is affiliated with Optimist International, an association of more than 3,000 Optimist Clubs around the world dedicated to “Bringing out the Best in Kids”. The mission of the Little Haiti Optimist Club is to make a difference in the lives of youth by providing education, mentorship, athletics, arts and cultural programming. Our goal is to be the premier organization providing programs to prepare the youth of Little Haiti for academic and life excellence. Little Haiti Optimist Club activities and programs empower and give young people a helping hand and hope. Some of the programs and activities include: Book Bag & School Supplies Giveaway; Mentorship Program; LHOC Career Day; REEL Opportunities Film Program; Brush Strokes ART Program; Little Haiti Keeping It Clean & Green; LHOC Reads; Turkey Giveaway; Toy Drive & Giveaway and athletics programs consisting of: soccer, football, wrestling, tennis, basketball, golf and track & field. For more info on LHOC, visit www.littlehaitioptimist.org. MLK Mural Project is a collaboration of various artists and students from around the world. They are responsible for over 100 murals in various cities in the United States, Brazil and in Haiti. Their goal is to empower youth through art education, by arming them with skills and knowledge to create public art. Past projects include: Detroit Super Bowl 2005, Major League Baseball 2006, US Open 2007, MLK East Busway 2007, G-20 Summit 2009, Albert Switzer Hospital in Haiti with the United Nations 2009-2010 to name a few. Miami on a family vacation where he has made it his home ever since. Serge is a skilled artist who usually works on large scale backgrounds over 5 feet. He is often referred to as the Michael Angelo of Little Haiti//Liberty City. He loves art and is proud of his Haitian heritage and community which is apparent to anyone walking in Little Haiti. Although he is well known in Little Haiti, his work can be found throughout South Florida. After 16 years of being a muralist, there is finally a compilation of his work in a book called Miami Muralist: Serge Toussaint, Neighborhood Paintings by a Haitian Artist by Rachel Goldberg.